If you're in the Southern Hemisphere, look up tomorrow morning, February 26, and brace yourself. You are going to see the Sun, big and bright as usual—that is, until it turns into a ball of black surrounded by a ring of fire. It’s the sort of sight that begs for two question marks: What is going on up there?? The answer is an annular eclipse. 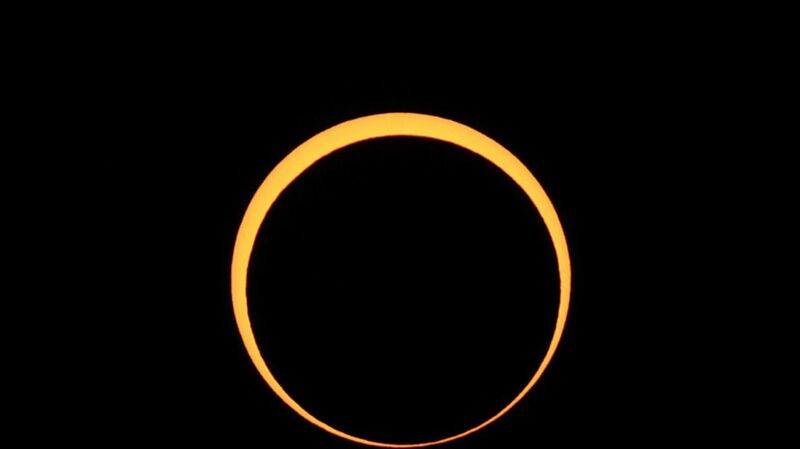 Like its more famous cousin, the total solar eclipse, an annular eclipse involves the moon crossing in front of the Sun. When we’re talking about eclipses, however, not all moons are created equal. For an eclipse to be “total,” the Sun must be completely obscured by the Moon, leaving only the Sun’s corona shimmering around a black disc. When this happens, the darkest part of the moon’s shadow—the umbra—is cast across the Earth. When viewing this from the zone of totality, where alignment is perfect, day will turn to night (and look around: animals will behave accordingly). Because the Moon’s orbit is not a perfect circle, it sometimes appears smaller in the sky than at other times. If this “smaller” moon crosses in front of the Sun, you get an annular eclipse. A tremendous black disc will still appear within the Sun but will not obscure our star completely. Rather than witnessing the spectacular view of the Sun’s corona, you’ll see the spectacular view of a fiery sky circle. Day will not turn to night when this happens. Earth at that moment will be in the Moon’s antumbra—that is, a weaker shadow beyond the tip of the umbra. A swath of South America and Africa—mainly in the southern parts of the continents—will experience this particular eclipse. It will begin on February 26, 2017 at 7:10 a.m. ET, and reach its maximum at 9:58 a.m. NASA Goddard Space Flight Center has a map of the eclipse’s path here. Don’t live in the Southern Hemisphere? Don’t feel left out! On August 24, 2017, a small path across the United States—Oregon to South Carolina—will experience a total solar eclipse. It’s interesting to consider that every day, a giant ball of fire hangs in the sky and we can never really get a good look at it without going blind. If you’re interested in seeing the eclipse tomorrow in person, you’re going to have to go toe-to-toe with a spherical celestial fusion reactor. Your eyes are no match for this, which means you will need special glasses. DO NOT WEAR REGULAR SUNGLASSES. Stare at the Sun wearing nothing but Ray-Bans and the only good news will be that you can wear them indoors forever thereafter, because you will be blind. The tinted windows in your car, the x-ray film your friend at the hospital swears will work—none of these things will protect you from a lifetime of charred and lifeless retinas. There are no half measures where the Sun is concerned. There are four things you can wear to look at an eclipse: welder’s goggles with a 14+ rating; special eclipse glasses; a “pinhole projector”; and a specially filtered telescope. Welding goggles can be found at industrial equipment stores, but be sure to get the correct shade—not just any goggles will do, and there is a good chance you are wrong. Eclipse glasses are available at specialty shops, though you'll need to beware of fakes. If you’re a teacher, you can make the eclipse a class event by allowing your students to make pinhole projectors themselves. It requires nothing more than a cardboard box, paper, and aluminum foil. If all of this sounds like a bit much, or if it’s a cloudy day where you are, you have options! Our friends at Slooh will be covering it, broadcasting footage of the eclipse with commentary from astronomers and solar scientists. Coverage begins on February 26 at 7:00 a.m. ET.